So summer is here and the BBQs and paddling pools are full steam ahead! It has been scorchio for the past few days and with bank holiday upon us and the traffic scheduled to be manic, we are taking the stay at home option and plan to enjoy some BBQ, local walks and catch ups with good friends. There will not be a motorway in sight for us! Personalised cutlery is fast becoming half of the business at the moment! I am steering clear of knives and forks. However, but have some new herb planter markers in the pipe line and also maybe a ladle or 2! I just love stamping spoon type things! Earlier in the year a friend asked if I would personalise some old silver plated salad servers for her and is usual for Impressions to Keep when something bespoke is created, a new product is born! So, now available on the web site are personalised silver plated vintage salad servers! 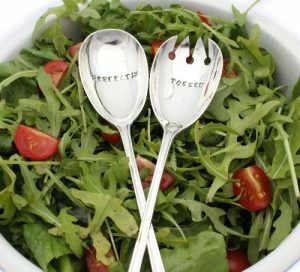 Personalised salad servers are brilliant gifts, perhaps for a wedding, engagement or maybe a birthday or just because you want a pair for your own salad! They are great fun, quirky and one of those items that will quickly become a key part of your cutlery drawer. Each silver plated salad server is vintage and you can choose to have your own message or perhaps stick to the cheeky little message my friend chose – ‘Perfectly’ & ‘Tossed’ – naughty and will certainly raise a smile with grown ups every time she uses them! Vintage personalised salad servers are all sourced from antique fairs and dealers, each pair slightly different and all with a history of their own, adding to their charm and character. I stamp each letter one at a time with a metal punch and a mighty heavy hammer; it is sometimes a risky business for my poor thumbs holding the letter punches, but hey, somebody has to do it! You can order the personalised salad servers from the web site and they typically take 3-4 weeks to be delivered, so don’t leave it too late to order if you wanted them for a special occasion! I’ll link you to the web site selly page for you to have a look at them! In the mean time, I have some new design collar stiffeners to make ….. so you never know, the next post might be about yet another addition to the Impressions to Keep range!